Ch: Zhongkui. A god in the Chinese Taoist pantheon known as the Demon-queller, often depicted in sculpture and painting. A devoted but flawed student, Zhongkui failed the national examination and in despair committed suicide. When Emperor Xuanzong (Jp: *Gensou 玄宗; 685-762) heard of this extreme act he had the degree and title Doctor of Zhongnanshan (Jp: Shuunanzan-no-Shinshi 終南山の進士) posthumously bestowed on Zhongkui. In return, the ghost of Zhongkui appeared to Xuanzong in a dream and promised to protect the empire from evil demons. Another version holds that when the Emperor was ill Zhongkui appeared in a dream and killed the demons who had plagued the Emperor, and in gratitude Xuanzong awarded Zhongkui the title. Pictures of Zhongkui were hung in homes to protect or rid them from demons especially at the Boy's Festival on May 5, and the practice of placing a small statuette of Zhongkui under the eaves of a house survives in Japan. 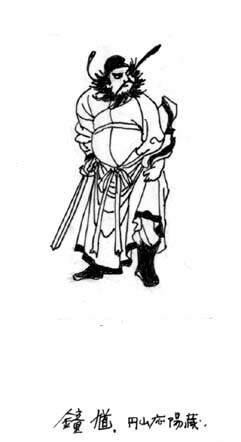 In paintings Zhongkui is usually shown with large eyes, a bushy beard, and wearing black robes and an official's cap. He is often depicted drawing a large sword or using it in battle with demons. Records mention images of Zhongkui from the Tang dynasty, but a painting attributed to the Northern Song artist Li Gonglin (Jp: Ri Kourin 李公麟, 1049?-1106) seems to be the earliest extant image. In Japan, of the countless paintings of Zhongkui, those by Yamada Douan 山田道安 (fl.16c, Engakuji 円覚寺, Kanagawa prefecture), Kanou Tan'yuu 狩野探幽 (1602-74), Watanabe Kazan 渡辺華山 (1793-1841) and Tanomura Chikuden 田能村竹田 (1777-1853) are well known.